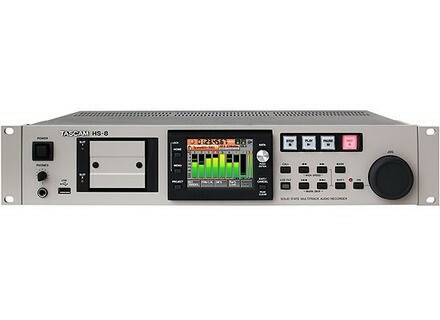 HS-8, Digital Multitrack Recorder/DtD from Tascam. TASCAM's HS-8 and HS-2 are the studio solutions for professional multi-track recording and playback to solid-state media. From studio surround recording to post production and broadcast playback of HS-P82 location recordings, the eight-track HS-8 is designed to fit a variety of multitrack roles from TASCAM's DA-88 recorders. Like the HS-8, the stereo HS-2 includes SMPTE timecode and RS-422 for use in broadcast and post production. [NAMM] Tascam LM-8ST The TASCAM LM-8ST is a 1-space rackmountable line mixer for installation, studio submixing, keyboardists or anyone who needs a sounding mix. [NAMM] Tascam DR-08 TASCAM's DR-08 portable digital recorder captures 96kHz/24-bit WAV files – or web-friendly MP3 files – to MicroSD media. [NAMM] Tascam MH-8 TASCAM has announced the MH-8, a headphone amplifier for studio, stage and installation.